Alan Pardew's former assistant, 50, will take charge of the team for the final 16 Premier League games. "Having explored at some length the options available to us, the decision has been taken to defer the appointment of a permanent head coach until the end of the season," read a club statement. "The head coach will be a long-term appointment that will play a major role in shaping the future on-field progression of Newcastle United," the statement added. "It is vitally important that we get the right individual." Carver said: "This is a proud day for me. I have worked with, and learnt from, the best manager that this football club has had in Sir Bobby Robson. I know what this club means to this city and its people. "I believe in my players and the staff I have around me. I am confident that we can deliver exciting, successful football and look forward with relish to my role as head coach of this great football club." Newcastle's managing director, Lee Charnley, said the club's original intention had been to appoint someone who could start work immediately. 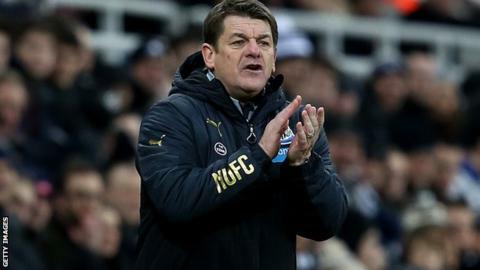 With that not proving possible, he backed Carver to guide Newcastle to a place in the Premier League's top 10 before making a decision on a permanent appointment in the summer. Charnley added: "John has a long history with the club and has the full support of the board. Our goal for the season of a minimum top 10 finish remains unchanged and we are confident that John, supported by the backroom staff, will be able to deliver this." Newcastle drew 3-3 at home to Burnley in Carver's first game on 1 January before losing 1-0 at Leicester in the FA Cup third round. They lost 2-0 at Premier League leaders Chelsea on 10 January and were defeated 2-1 at home by Southampton on 17 January. After the Southampton defeat, Carver urged Newcastle to act quickly to appoint a successor to Pardew. Frenchmen Remi Garde and Christophe Galtier, German Thomas Tuchel and Derby County boss Steve McClaren have been linked with the post. Newcastle sit 11th in the Premier League ahead of Saturday's match at Hull.